To Cite: Ilkeli E, Saffet Kahyaoglu O, Capci S, Buyukkaya R, Aydin Oktay N, et al. Pharmacomechanical Thrombolytic Treatment in Symptomatic Acute and Subacute Deep Vein Thrombosis, Iran J Radiol. 2017 ; 14(1):e13467. doi: 10.5812/iranjradiol.30559. Background: In this study, we shared the implementation success and clinical results for 38 patients treated with the cleaner™ pharmacomechanical thrombectomy device. Objectives: The impact and results of pharmacomechanical thrombectomy treatment on patients with deep vein thrombosis in the symptomatic acute and subacute phases were assessed. Patients and Methods: Pharmacomechanical thrombectomy treatment was applied in a single session for 38 patients with lower extremity deep vein thrombosis in the acute and subacute phases between May 2012 and June 2014. Venography was performed and each assessment was made based on lysis rates and clinical results. Results: Deep vein thrombosis was found in the left lower extremity in 25 patients (65%) and in the right lower extremity in 13 patients (35%). No patient was found to have bilateral deep vein thrombosis. Thrombus localization was in the iliofemoral area in 17 patients (44%), the iliocaval area in three patients (8%), and the femoropopliteal area in 18 patients (56%). When thrombus resolution was assessed at the end of the process, grade III and grade II lysis was achieved in 36 (94%) out of 38 patients. Complete resolution was achieved in 28 patients (74%) in the acute and subacute groups. Conclusion: Pharmacomechanical thrombectomy provides very satisfactory results in a single procedure, as a new method in the treatment of acute and subacute deep vein thrombosis. In deep vein thrombosis (DVT), endovascular treatment has been used as an alternative method for the last two decades. Oral anticoagulants alone are insufficient in preventing pulmonary embolism and recurrence, and the potential risks of long-term drug usage have made alternative treatment options important (1). Catheter-directed thrombolysis (CDT) and pharmacomechanical thrombectomy (PMT) have become increasingly common as an alternative to thrombolytic treatment. Especially, early treatment and resolution of thrombosis in acute or subacute phase ensures early elimination of symptoms and prevents life-threatening complications, such as post-thrombotic syndrome (1, 2). In single-session PMT, thrombus localization is established by performing venography, then an inferior vena cava (IVC) filter is inserted and mechanical and thrombolytic treatments are applied simultaneously. In this study, we investigated the implementation success and clinical results for 38 patients treated with PMT. The aim of this study was to assess the success and results of pharmacomechanical thrombolysis with a rotational thrombectomy catheter in patients with DVT in the symptomatic acute and subacute phases. A total of 38 patients (22 females, 16 males; Mean ± standard deviation [SD] age 60.1 ± 29.1) with lower extremity DVT who presented in the acute (< 14 days) or subacute (< 28 days) phases between May 2012 and June 2014 were included in the study. All patients in the chronic phase of DVT and three patients with a previous diagnosis of Behcet’s disease were excluded from the study due to recurring DVTs and pulmonary embolisms. All patients presented with pain and swelling in the leg. The demographic features of the patients and their predisposing factors are shown in Table 1. The Factor V Leiden mutation was found in two patients under the age of 40 and only in one patient out of five years with a family history suggestive of thrombophilia. Another four patients with a family history had no systemic disease. No risk factors were identified in 20 of the patients. Abbreviations: COPD, chronic obstructive pulmonary disease; DVT, deep vein thrombosis; OC, oral contraceptive; SD, standard deviation. Eighteen patients (47%) were in the acute phase of DVT, while 20 (53%) were in the subacute phase (Table 2). DVT was found in the left lower extremity in 25 patients (65%) and in the right lower extremity in 13 (35%). None of the patients had bilateral DVTs. The thrombus was located in the iliofemoral area in 17 patients (44%), the iliocaval area in three (8%), and the femoropopliteal area in 18 (56%) (Table 3). The patients were diagnosed based on clinical examinations and venous Doppler ultrasonography (USG), and the diameters of their calves and femurs were recorded. Detailed treatment options explained for the patients, and informed consent was obtained. PMT was implemented simultaneously with venography within 12 - 72 hours for all patients. A total of 10 mg of tissue plasminogen activator (t-PA) was administered to all patients as thrombolytic treatment during the operation. Thrombolysis success was graded and the results were recorded. The patients were assessed based on follow-up Doppler USG results, symptoms, and calf/femur diameters at one month, six months, and one year. In our study, a rotational thrombectomy catheter (Cleaner™; Argon Medical Devices, Inc., USA) was used. During the operation, the 9- and 15-mm sinusoidal vortex wire options for the catheter were selected according to vein diameter. The system was designed to dissolve the thrombus mechanically and pharmacologically with the combined impact of the thrombolytic agent and the sinusoidal vortex wire at different diameters (9 and 15 mm), which was manipulated manually without damaging the wall. The Option Elite (Argon medical devices, Inc., USA) was used as the IVC filter in our study. This filter had a femoral/jugular insertion piece made of a nitinol substance in a conical structure, as a permanent or removable feature. The procedure was performed on all patients under local anesthesia in the catheter laboratory. The patients were covered in a sterile fashion and placed in the supine position for the first phase. Electrocardiographic monitoring was performed. A puncture with a 7-F sheath was made to the contralateral femoral vein under ultrasound guidance. The IVC filter was placed below the renal vein level and correct localization of the filter was confirmed by contrast injection (Figure 1A). The patients were moved to the prone position for the second phase. A puncture was performed with ultrasound guidance to the ispilateral popliteal vein, and a 7-F sheath was inserted. Thrombus was localized by contrast injection (Figure 1B). The catheter was advanced and the mechanical thrombectomy process was performed beginning from the distal segment of the thrombus. Next, 10 mL of saline was administered with 1 mg of t-PA (Actilyse; Boehringer Ingelheim, Germany) along each segment to dissolve the thrombus completely, then we moved on to the next segment. We preferred the 9 mm - 65 cm vortex wire for thrombi at the femoropopliteal and iliofemoral levels. We elected to use the 15 mm - 135 cm vortex wire for the proximal iliocaval segment due to the larger diameter and increased thrombus load (Figure 1C). The catheter has two features that enable both the administration of the thrombolytic agent and aspiration of the thrombus, which was fragmentized mechanically. The distal tip of this thrombectomy catheter creates a strong mechanical impact in the sinusoidal form at 4000 rpm. Each procedure ended when sufficient recanalization and thrombolysis was demonstrated with radiopaque dye (Figures 2A - 2C). Figure 1. A, Thrombosed iliac and femoral veins, where there is no passage to the IVC on venography (arrows); B, Pharmacomechanical thrombectomy (PMT) catheter in the iliocaval segment (upper arrow) and fragmentized thrombus in the iliac vein (semicircular arrow); C, Insertion of inferior vena cava (IVC) filter (arrow) before PMT. Figure 2. Popliteal recanalization (A), femoral recanalization (B) and iliocaval recanalization (C) after pharmacomechanical thrombectomy. Thrombus resolution success was assessed with venography as phase III (complete), phase II (> 50%), or phase I (< 50%), and the results were recorded. All patients received unfractionated heparin for 2 - 4 days after the procedure, then warfarin treatment was started. The patients were assessed with Doppler USG at one month, six months, and the end of the first year. International normalized ratio (INR) values were maintained at 2 - 3. 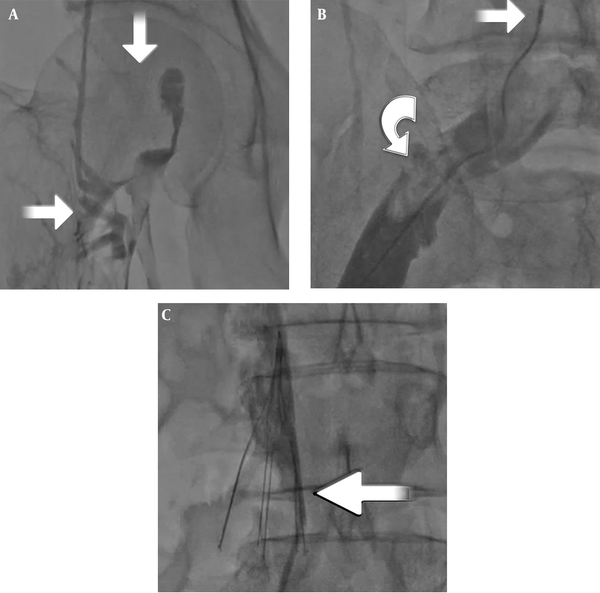 The IVC filter could not be removed and warfarin treatment was continued due to partial thrombus in the iliac vein in only two patients by the end of the first year. The patients’ leg diameters before and after PMT were measured at the femur and calf levels, and assessed statistically. SPSS software ver. 18.0 (SPSS Inc. Released 2009, PASW Statistics for Windows, Chicago: SPSS Inc.) was used for the analysis. The pre- and postoperative calf and femur diameter changes of the patients in the acute and subacute groups were assessed, and P value < 0.05 was accepted as statistically significant. Diameter averages, standard deviations, and p-values were calculated with the t-test for independent samples. No major complications, such as bleeding, vein perforation, or pulmonary embolisms, developed during any of the procedures. Hematomas developed in the popliteal area in two patients. IVC filters were inserted successfully in all patients. The caval filters of patients whose thrombi in the femoropopliteal and iliofemoral regions were recanalized at the end of the first month were removed in the second month. 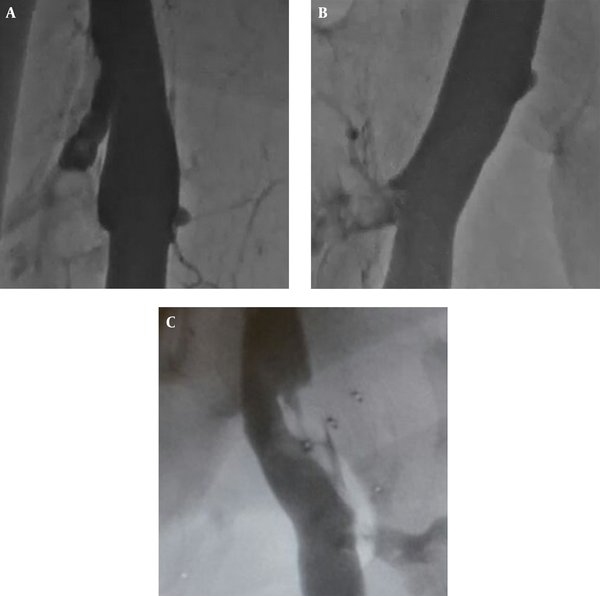 Filters were not removed in two patients whose iliocaval and iliac thrombi were not totally recanalized. We detected significant decreases in femoral and calf diameters 48 hours after the procedure, and there was a significant reduction in symptoms of pain and swelling at the first-month follow-up, when only two patients complained of swelling in the leg. It was noted that the thrombi of these two patients were partially recanalized on the one-month, three-month, and one-year in Doppler USG evaluations. On Doppler USG, no thrombi were detected at the first month in 18 patients who were diagnosed and treated in the acute phase. The response to venous compression was complete and there was no reflux flow in these patients. Thrombus sequela without limitation of flow was detected in 8 of the 20 patients who were diagnosed at the subacute phase. The thrombi were totally resorbed by the end of the first year in these patients. We found partial thrombus only in two patients on Doppler USG performed at the end of the first year. When pre- and post-operative femur and calf diameters were assessed with paired sample t-test, there was a statistically significant difference between the acute and subacute phase patients (P < 0.005) (Tables 4 and 5). When thrombus resolution was assessed at the end of the procedure, complete resolution was confirmed in 28 patients (74%) in the acute and subacute group. Grade II lysis was achieved in 8 patients (21%) and grade I lysis was achieved in two (5%). Grade III and grade II lysis were achieved in 36 (94%) of the total 38 patients (Table 6). Complete recanalization at the end of the first year, a response to compression, and being asymptomatic were accepted as conditions for treatment success in the present study. The success rate was 94% after PMT catheterization in acute and subacute DVT patients. Warfarin therapy was discontinued at the end of six months in 30 patients with DVT in the acute and subacute phases. Warfarin treatment was continued until the end of the first year for partial thrombi on Doppler ultrasound after six months in eight patients who were diagnosed in the subacute phase. Warfarin was only deemed necessary for two patients at the end of the first year. Oral anticoagulant bridging therapy with unfractionated or low-molecular-weight heparin is still the mainstay treatment for DVT. The main aim is to prevent thrombus formation and pulmonary embolism. However, this treatment option is not sufficient, especially in patients with proximal DVT and a high thrombus load; therefore, a large proportion of patients are exposed to post-thrombotic syndrome and ulcer development (2-4). Most evidence supporting the benefit of early thrombus removal has been obtained after open thrombectomy procedures. When anticoagulant treatment is compared to thrombectomy or early thrombus resolution in randomized controlled studies, thrombus removal is very beneficial due to the high rate of vein patency, decreased venous hypertension, decreased edema, and prevention of post-thrombotic syndrome (5). For acute DVTs, PMT has been developed over the last decade as a treatment alternative to open surgical thrombectomy and catheter-directed thrombolysis (CDT). Although the long-term results of this treatment have not been examined in randomized controlled studies, successful PMT implementations have been reported in observational studies (6). In DVT treatment with the PMT device, the thrombus is mechanically fragmentized/dissolved with a single catheter while thrombolytic agents are directly administered. According to our experience, another important difference from CDT is the manner of implementation. The PMT device allows manual manipulation in all segments, ensuring duration/mobility distally or proximally, thus providing the opportunity to visualize the thrombus and administer the thrombolytic agents in the same segment. Therefore, there is no need to visualize the operation. The rate of major hemorrhage with CDT is between 2-4% (6, 7). There is a consensus on adding CDT or thrombolytic treatment in patients with no contraindications, along with PMT treatment (7). We did not encounter any major hemorrhages in the present study, and we identified hematomas around the popliteal vein in two patients (5%). Compression treatment was sufficient for these patients and there was no need to perform transfusions. The thrombus resolution rates obtained in the present study were similar to those in the literature (8, 9). This study indicates that the PMT procedure (with a rotational PMT device) can be used in patients with symptomatic acute and subacute DVT to ensure safe and effective lysis. Over 50% thrombus resolution was obtained in single operations in 94% of the patients (grade II and III lysis), while grade III lysis was achieved in 74% with PMT. No major complications occurred in any of the patients. Thrombus resolution was < 50% in two patients, likely because these patients presented in the subacute phase, and this may also have depended on the quality of the thrombus; thrombus resolution (grade II and III) rates in the acute phase compared to the subacute phase were 100% and 90%, respectively. Another factor may have been the length of time between presentation and the application of PMT. Grade III lysis occurred in 60% in the subacute patients, which supports the above hypothesis. It has been reported that if symptoms have been present for more than 10 days, in general, the complete thrombus resolution rate is reduced (10). It has also been reported in recent studies that the use of IVC filters in endovascular interventional operations reduces the risk of iatrogenic pulmonary embolism (10-12). In our study, IVC filters were successfully implanted in all patients, and no pulmonary embolism occurred in any of the patients. The filters were removed from all patients except for two. We believe that despite the aspiration feature of the PMT catheter, IVC filters should be used routinely in all patients. Since the thrombus moves in the flow direction to the central parts of vascular system, the catheter aspires the clots near the lumen; however, it is insufficient in segments with a greater thrombus load. The recently developed IVC filters can be removed while the patient is in bed after resolution of thrombus is achieved. However, we do not have any experience with this. We achieved satisfactory results in patients who presented in the acute and subacute phases. There was recanalization in the lumen on the control USGs, and there were no residual thrombi or diameter difference were seen. Partial thrombus residues were seen in the lumen on control USGs in a few patients in the subacute phase. A dramatic reduction was observed in complaints and leg-diameter differences in these patients. The present study investigated only the short- and mid-term technical and clinical success of a rotational thrombectomy catheter for the treatment of DVT in the acute and subacute phases. However, further randomized controlled trials are needed, with greater numbers of cases. A limitation of this study was that it did not evaluate long-term results, especially with regard to late development of post-thrombotic syndrome. We think that rotational thrombectomy together with stent implantation in appropriate cases would be useful to improve long-term patency. According to these results, the method of PMT (rotational PMT) by means of a catheter can be safely applied. This study also showed that this procedure provides very satisfactory thrombus resolution results in acute and subacute DVT, and ensures significant symptomatic recovery in patients. Authors’ Contribution: All authors listed on the title page have read the manuscript. Financial Disclosure: The authors have no relevant financial interests or financial conflicts.